The human spine is composed of 24 bones. The bottom 5 and the tailbone are called the lumbar spine. Your bones are coupled together by delicate joints. The normal working of these joints allows free back movement and normal posture. Injury to the lumbar spine can result in one or more of these joints locking out of position. This causes pressure on the delicate nerves that are situated close by these joints. Result: pain. Back pain known as antalgia is commonly caused by injury to the delicate discs that sit between the bones of the lumbar spine. 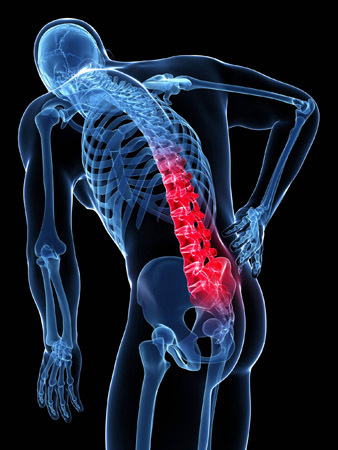 Injury to the disc can cause a dramatic lean of the spine to left or right side resulting in pain. Acute disc injury can be a distracting pain that starts in the lower back and extends down into one or both legs. Chiropractic care has proven to be quite helpful. Before submitting to dangerous and irreversible surgery, more and more patients are seeking the natural approach offered by chiropractic. Those suffering from acute disc injury are often in their 40s and 50s. It usually begins as an acute pain in the lower back and then extends down the back of either leg. The pain usually worsens with long periods of sitting or standing. The soft, pulpy disc between each spinal bone is the tissue involved and if often squeezes against the sciatic nerve While a disc can’t “slip,” it can bulge, herniate or rupture. This can put direct pressure on the nearby nerves. The result? Swelling. Inflammation. Pain when coughing, sneezing or with others kinds of movement. Acute disc injury often worsens with extended bed rest. Pain pills or muscle relaxers are unable to correct the nerve compression caused by the bulging disc. Physical therapy merely works the area to increase your tolerance to pain. Surgery often involves cutting away disc tissue or removing bone to make room for the nerve. Improving joint motion with a series of chiropractic adjustments has produced results for millions. “Before” and “after” images of the lower back often show improved disc height and spacing. Many patients report that they can resume their lives and that their symptoms disappear. Without resorting to drugs or surgery. Your chiropractic doctor is uniquely skilled to evaluate and reduce the most common cause of acute disc injury pain. It’s the natural approach to relief and better health. There is hope! Antalgia from the Greek ‘away from’ and ‘pain’ is how your body tries to reduce the pain caused by acute disc injury by leaning the spine away from the side of the injury. How do you get acute disc injury? It’s easy to trace some spinal problems to an event, such as a car accident. Yet, acute disc injury is often the result of cumulative damage. Years of bad posture, poor muscle tone, excess weight or countless other causes set the stage. Then, something simple like bending over to tie your shoes can trigger an episode. Can chiropractic cure acute disc injury? Most acute disc injury patients are delighted with the results they get after weeks or months of care. Naturally, this varies from patient to patient. After a relapse or two, many discover that years of neglect have produced spinal instabilities that never fully heal. These patients elect to continue with periodic chiropractic check-ups. It’s up to you. If you are suffering from Antalgia, caused by acute disc injury, the team at Mind & Body Chiropractic can help you. Arrange for a consultation with one of our specialists today.